Marta Jakimowicz is an art critic and curator based in Bangalore. 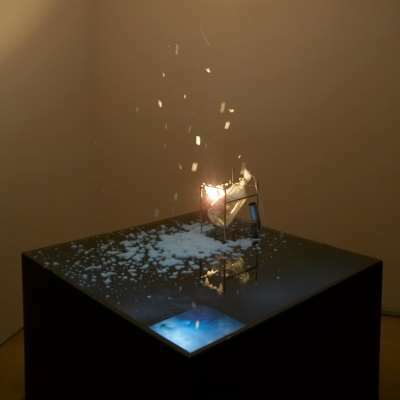 Among the works by Susanta Mandal shown at gallery Ske, Bangalore, from July 8th to August 11th was a black box, on which stood a bottle slowly releasing a series of soap bubbles. These bubbles, in turn, soared towards an open steel structure that resembled a cage. They fell and popped softly on a back-lit photographic image of a cloud-covered sky. The visual energy generated by this act of continuous dynamism - of ephemeral, fragile forms playing against solid, static ones - yielded an experience that took delight in transitoriness. Quite in the way of a performance, the ‘sculpture’, in its transfiguring movements, hinted at natural occurrences as well as changing states of the human body, mind, and imagination. 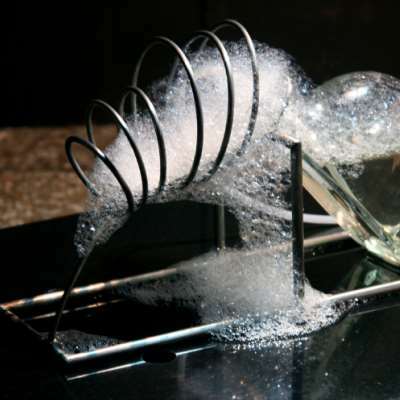 There were a number of smaller sculptures on display at the show as well - these works had glass bottles and tubes pouring out bubble formations over the cold, exact geometries of shiny-smooth steel and granite plates. Framed by prohibitive-looking, metallic grids, the bubbles seem to get restricted; they floated free, however, over time, their faceted mass sliding down glistening surfaces. As they burst out, you recognized gravity and pain in the gentle lyricism here. The many-layered imagery in the works relied on the many inter-connections between the materials - the artist, under the obvious influence of minimalism, uncovered their ‘particularities’ quite ably. The viewer could see the black rectangular stands and steel grids through the translucent soap bubbles and glass. The lighting on the shiny bubbles made them look quite self-contained. The same light, though, created shadows, suggesting a tentative presence - perhaps, depicting fear. Simple mechanisms physically drove the works - motors with timers, air pumps, and blowers. 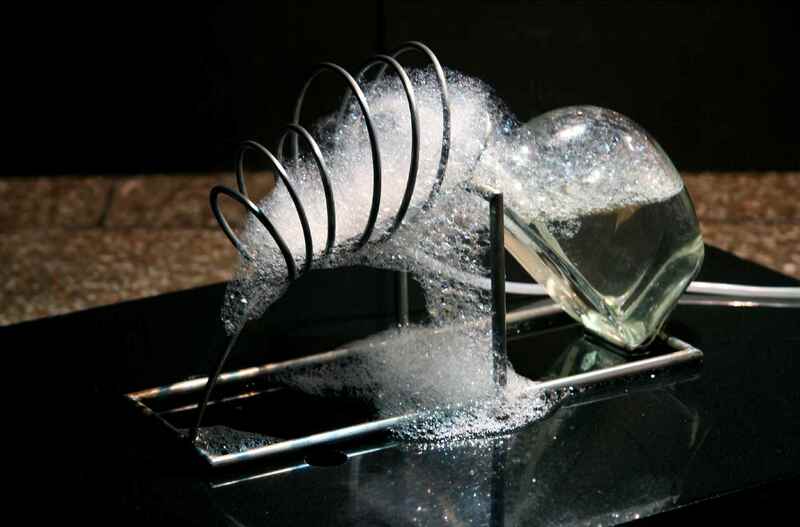 Their easy technological character interacted in a complementary/contradictory way with the organic character of the bubbles. Volumes could be defined by the lines but could also be created by an intangible, fluid substance, you realized. Steel grids stood firm and open as though they were unfinished strokes. Colorless metal and glass held traces of hues. One of the ‘sculptures’ consisted of a pair of rough, shadowy scissors that humorously underscored the impossibility of cutting bubbles (as well as the realness of absurd anxiety). Another one used tray claws to create the same effect. A very different work with twelve, two-dimensional panels, amusingly but delicately suggested the presence of pain - there was an outline of an open mouth with a blowtorch instead of a dental gun in some of the panels. 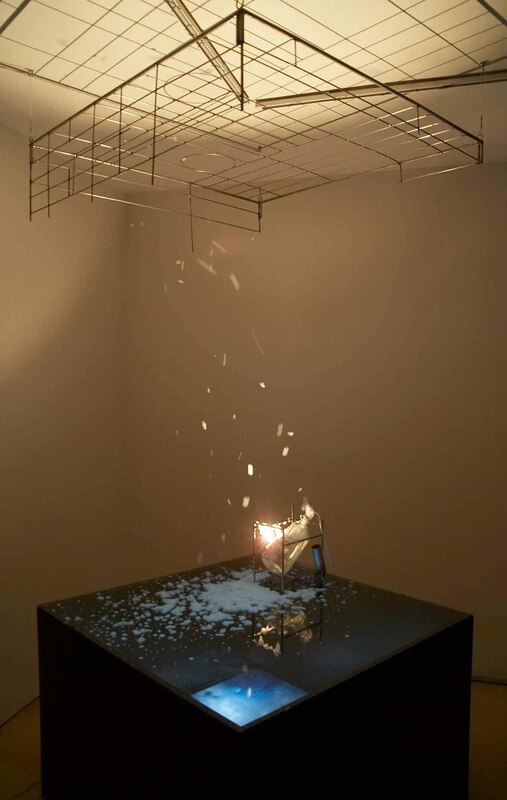 Through a sequence of images and objects, Mandal seemed to engage in ‘explaining’ the technology behind the work. The work drew from resources of drawing and painting and also used LED technology effectively as represented images ‘grew into’ real wires and transformers. A startling kinetic ‘sculpture’ comprised of a raw jute sack, which suggested a body wriggling inside. The mood here hovered between being eerie and comic as the idea of victimhood was dramatized - one could see a close-up video of the sack on a screen as well. The artist alluded here to the sensational distortion of trivia by the mass media. In a multi-panel component, which was part of the work, Mandal divulged with patience worthy of scientific charts, that the sack hid only a mechanical contraption. (The title of the show captured this ironic mood quite effectively - it was called, It Doesn’t Bite!). The piece combined the different kinds of ‘motion’ that informed Mandal’s art - drawn, mechanically induced, organic, and virtual.